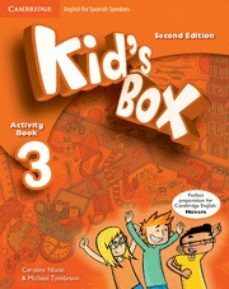 Resumen de Kid"s box for spanish speakers 3: activity book with cd-rom and language portfolio Contiene: -2 Libros - CD-Rom Cuaderno del alumno Kid"s Box is a brand new, six-level course for young learners, brimming with stimulating sections designed for Spanish speakers. Bursting with bright ideas to inspire both teachers and students, Kid"s Box gives children a confident start to learning English. It also fully covers the syllabus for the Cambridge Young Learners English (YLE) tests. This Activity Book covers all of the target language from Pupil"s Book 3, providing further practice in a fun context. The Spanish edition of the Activity Book provides extra practice of the Spanish specific content in the Pupil"s Book. The CD-ROM is packed with games to promote learning through fun activities. The Portfolio allows students to monitor their own progress. Level 3 begins the Movers cycle.